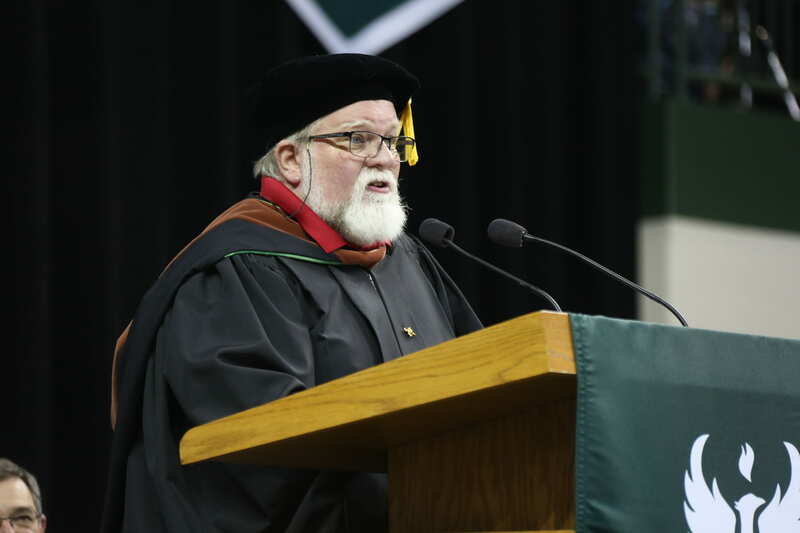 The following speech was given by UW-Green Bay Theatre and Dance Professor Jeffrey Entwistle to UW-Green Bay’s 2018 Spring Commencement attendees. “Welcome graduates and welcome to your families, friends and all our special guests. I would also like to thank Chancellor Miller for the honor and invitation to speak with you today. You need to know, we have a lot in common. I know it might not seem so from where you sit, but I really have a lot in common with all of the graduates today. Forty years ago this spring I was sitting outside in a tent in Bridgewater, Massachusetts experiencing exactly what you are today. One year earlier, at my fiancé’s graduation, I sat under the same tent and listened to Shana Alexander deliver the commencement address. Ms. Alexander was a famous journalist best known for her work on (the television show) 60 Minutes. I think the graduates that day were probably more excited that her 60 Minutes debates had been satirized by Jane Curtin and Dan Akroyd on this fairly new TV show, Saturday Night Live. So there I sit, one year later, anticipating another famous journalist or TV personality, when out comes our speaker for commencement — a long-time Bridgewater State professor who I never had a class with, whose name I sadly cannot remember, and whose words that day were actually inspirational in the moment, but in my interest in getting on with my life, I have not committed any of it to memory. Admittedly, I can’t remember what Shana Alexander said either. So I apologize for any of you out there who were hoping some celebrity would speak to you today. At the very least you may be able to remember when you all had that Santa Claus-looking professor speak at your graduation and he was even wearing red under his robe. In fact, when this Santa leaves here today I will hopefully be able to complete my Naughty and Nice list for the year, you know what I am talking about…final grades. Even though I am the only one here who looks like Santa, there is still something more that we do have in common. When we first arrived at UW-Green Bay, (most of you graduating today), and me, 34 years ago… We all had similar plans to leave UW-Green Bay in a few years and get on with our lives and careers. Something you have all achieved today. You will move on. You are graduating from UW-Green Bay successfully. You have fulfilled your primary goal to leave this university on this day! I failed at that same goal almost 30 years ago and I have failed to leave year-after-year since. 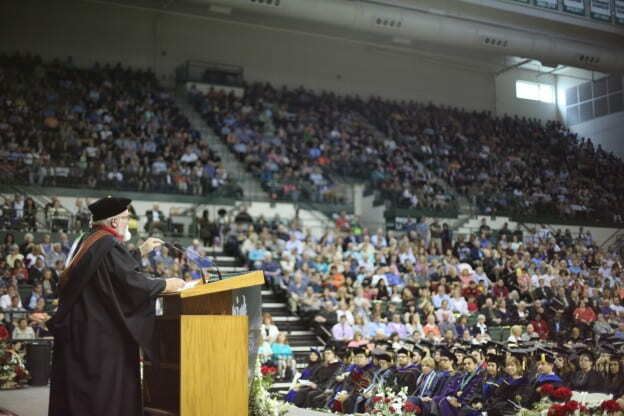 Right about the time I should have been leaving UWGB with my tenure in hand, a group of my very first students, who had arrived the same year I did, walked across the stage at graduation and something happened to me. I was hooked, I was, in fact, inspired! I was inspired by their success. It was not only about the professional skills they had developed; I was inspired by the people they had become in those four or five years. They never once tried to inspire me — they were too darn busy trying not to make my Naughty list. Ask any faculty on the stage behind me about what the best part of teaching at UW-Green Bay is and they will probably all tell you the same thing. It is our students; the students we all get to work with. You student: you are extraordinary. Seeing students succeed, seeing you succeed, inspires all of us to keep on going. By the time you get to the end of your degree, hopefully you have really honed some of those important professional skills. But oft times to me, I so hope you have learned to engage your social conscience and I so hope you have developed a genuine understanding of the human condition. Thinking about social conscience and the human condition reminds me so much of last year’s Outstanding Student, Riley Garbe. He displayed that social conscience I have spoken of today and he had a first-hand understanding of the breadth and depth of the human condition that was awe inspiring. I think every faculty member and administrator on stage today that was in this building was inspired by Riley on that day. We just heard such inspirational words from Bao Xiong, and as a parent, if I am this emotional, I can only imagine how proud and inspired her mother is right about now. It is also inspiring to know that many of us on stage might have been sewn into other student’s versions of Bao’s second-family thread. What a wonderful thought. What a wonderful legacy. Every semester I see so many non-theatre students in my Intro to Theatre class that are so timid and uncertain, given their lack of “theatre experience.” But by the end of each semester, there are so many of them that have completed incredibly creative and deftly written final projects that amaze me. There are so many alumni of ours that have gone on to successful professional careers and meaningful personal lives, and they continue to inspire me. Many of them have had such extraordinary professional success both nationally and internationally that I am completely humbled. You all are about to join them. They were armed with the same thing all of you have — an interdisciplinary education from the University of Wisconsin-Green Bay. You have developed an ability to focus on and solve problems in every field of study we offer and you have developed a social conscience that allows you to understand the complexities of the human condition. Take all of that with you when you leave this beautiful campus. Use all of that, and you have everything you will need to move on and become a successful professional and a truly engaged citizen of this great democracy. Meanwhile, here, I will stay for year 35. Freshmen registration is right around the corner and I am on the precipice of yet another theatrical UWGB Groundhog Day. We need you to inspire us. Inspire us: become an engaged citizen and use your voice. Inspire us: remind the world that humanity has no color. Inspire us: remind the world that “all lives matter”. Inspire us: support school safety & a reduction in gun violence. Inspire us: support First Nations throughout the country. Inspire us: support your peers that are dreamers—and their families. Inspire us: raise your own beautiful families. Inspire us: support the arts. Inspire us: support the LGBTQ community. Inspire us: support public education. Inspire me: believe in Santa. This entry was posted in Leading & Learning and tagged CAHSS, commencement, Theatre and Dance, Video on May 12, 2018 by Editorial Student.